The Musée Mémorial Bataille de Normandie in Bayeux is one of the best D-Day Landing / Operation Overlord museums to see in Normandy, France. The Battle of Normandy Memorial Museum (Musée Mémorial Bataille de Normandie) in Bayeux covers the invasion of France by the Allies in June 1944 from the D-Day Landings to the end of the Battle of Normandy. The museum has a large collection of military hardware on display as well as uniforms, smaller arms, and items used by the military and soldiers during the Second World War. A large number of maps, diagrams, dioramas, video and audio material makes it possible to follow the progress of the Allied invasion almost day-by-day and even hour-by-hour for key events. The Battle of Normandy Memorial Museum in Bayeux is at 2,300 m2 the largest museum on the Battle of Normandy (others are bigger on D-Day and smaller operations). 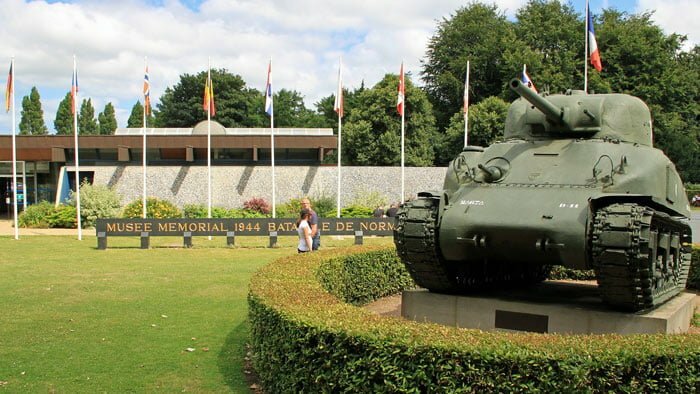 The museum gives a good overview making it worth visiting in preparation to seeing the D-Day landing beaches, related sights and more specialized museums. 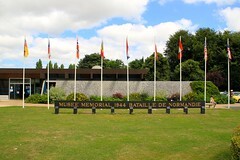 The Musée Mémorial Bataille de Normandie covers the run-up to D-Day – both the Allied preparation and the German construction of the Atlantic Wall. The military forces and commanders (American, British, French, and German) are introduced before a large display on D-Day explains the five landing zones of the invasion on June 6, 1944. The main focus of the museum is the Battle of Normandy that lasted from the day after the successful D-Day landings to August 21, 1944. During this period there was always a high risk that the German Army could succeed in forcing the Allied troops out of France. Each major operation during the Battle of Normandy is explained in detail with photos, maps, sketches, video and audio material. Uniforms, military equipment and other contemporary items from both Allied and German forces enhance the detailed explanations. The half-hour movie is worth seeing. A large diorama explains the Battle of the Falaise Pocket (or Gap) from August 12-21, 1944. The German Seventh Army was decisively beaten here with a great loss of lives and equipment. This is generally seen as the end of the Battle of Normandy with Operation Overlord ending by the end of the month after the liberation of Paris (August 25) and the German retreat across the Seine River. Further military vehicles and heavy equipment can be seen in a hall towards the exit of the museum. 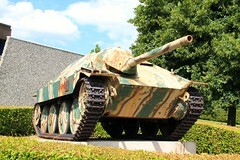 The four tanks outside the museum is always accessible and can be seen for free – US M4 Sherman and M10 Tank Destroyer, a British Churchill Crocodile flamethrower and a German Hetzer Jagdpantzer. This Bayeux museum is one of the most respected in Normandy for getting the facts on military strategy right. 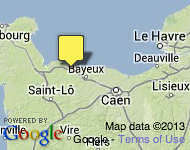 The information on offer is vast, probably more detailed than most visitors would be able to take in on a single visit. Some may complain about the lack of interactive displays, as common in newer museums, but at least here nothing is dumbed down in favor of glitz. 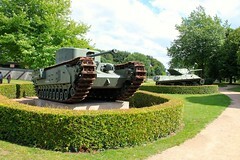 The Battle of Normandy Memorial Museum is open daily from 10:00 to 12:30 and 14:00 to 18:00. From May to September, the museum is open daily from 9:30 to 18:30 without lunchtime closure. Last admissions are 45-60 minutes before closing time both in the morning and afternoons. Arrive early – many visitors spend more time here than expected. The museum is closed over Christmas and from December 31 to mid-February. Admission tickets are €7 for adults, (€5.50 for children, and free for children under 10). Combination tickets are available with the Bayeux Tapestry and Art Museum (MAHB) – see any two museums for €12 (€10.50) or all three for €15 (€13.50). This is good value as the Bayeux Tapestry alone is €9. Some discount passes are accepted. The Battle of Normandy Memorial Museum is in Boulevard Fabian Ware to the south of the old town center of Bayeux – around a ten-minute walk from the cathedral. The summer mini-train stops here. Ample free parking is available at the museum. The Bayeux War Cemetery – the largest British and Commonwealth military cemetery in France – is diagonally across the road from the museum. It is always freely accessible, which make it a good option to visit while waiting for the museum to reopen after lunchtime.